Kia Optima Sportswagon Review 2019 | What Car? The Kia range is continuing its spread its wings to all corners of the market, offering everything from the excellent Picanto city car to the sporty rear-wheel-drive Stinger, with its family SUV, the Sportage, and its gargantuan one, the extraordinarily spacious Sorento, in between. 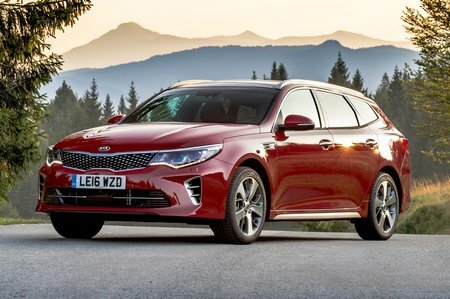 But it hasn’t abandoned the more traditional markets, with the Kia Optima Sportswagon still offering buyers the choice of a big, practical estate. Speaking of traditional, the engine options include a 1.6-litre CRDi diesel, a 2.0-litre T-GDi turbo engine in top-of-the-range GT trim and, for those of a more progressive mindset, a plug-in hybrid option. As you might expect, the Sportswagon comes in a variety of trims and with a choice of manual or automatic gearboxes, but when all’s said and done, does it do enough to elevate itself above the competition? After all, that includes cars that arguably spring more readily to mind, such as the venerable Ford Mondeo and Skoda Superb estates. To answer that question and help you pick your way through the Optima Sportswagon line-up, keep reading through our review and we’ll furnish you with all the information. Don't forget, for the very best deals on the new Optima Sportswagon, head to the New Car Buying section of our website.